Laser lithotripsy, which utilises laser energy to fragment stones. LithoClast™ lithotripy, which allows either ultrasonic or pneumatic fragmentation. After fragmentation, stone retrieval baskets can be passed via the ureteroscope to extract the stone fragments. ESWL is a procedure which fragments stones until they are small enough to pass by focusing shockwaves through an acoustic lens, most commonly using electromagnets to generate the shockwave. The procedure is suitable for small stones, < 2 cm in diameter. It is entirely non-invasive, no tubes or incisions are made. It is is a qday-only procedure performed under general anaesthetic. Following the procedure you may experience some modest brusiing and blood in the urine. After fragmentation, stones can take up to six weeks to pass. In 25% of cases require more than one treatment. Some stones located in the kidneys are too complex to remove using ureteroscopy. Percutaneous nephrolithotomy is a procedure in which a small incision in the skin is made under X-ray guidance allowing the surgeon to see inside the kidney using a small tube called a nephroscope. Like a ureteroscope, this tube contains a camera on the end allowing the stone to be visualised. It can then be fragmented and removed using lithotripsy. This technique is useful for removal of very large kidney stones, > 2cm in length. Open stone surgery is very rare in the modern era – less than 1% of cases are treated with open surgery. Open surgery may be necessary for large stones that have been stuck in the ureter for and extended period or for complex kidney stones, called staghorn calculi, that are at risk of completely obstructing the flow from the kidneys and causing tissue damage. 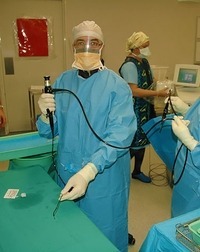 Doctor Katelaris utilising the flexible ureteroscope. 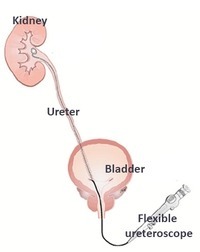 lexible ureteroscopy: a flexible tube is passed through the bladder into the upper urinary tract to allow access to the stone, which is then fragmented or removed.